We explain how the K53 examiners will mark you during your Motorcycle Licence Test – see what errors will cost you the most points and what areas you need to focus on most. Being a safe rider is the number 1 priority. Learn about the Yard Test for the Motorcycle. The whole of the South African Motorcycle Driver’s Licence Test is conducted in the yard at the Driving Licence Testing Centre. Before you can get your Driver’s Licence, you need to obtain a Learner’s Licence. You obtain a Learner’s Licence by writing a Theory test which covers Rules of the Road, Road Signs and Markings, and Vehicle Controls. Once you pass this test, you are allowed to learn to drive on the roads of South Africa and apply to take a Driver’s Licence Test. If you don’t yet have your Learner’s Licence, check out GetYourLearners.co.za! 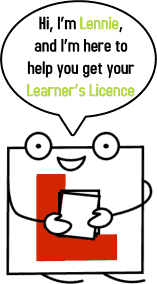 It’s a free site that helps people study for the Learner’s Licence Test. It provides revision material covering all the subjects in the test as well as a bonus “cheat sheet” with all the numbers you need to know made into a handy list. The site also offers a K53 Mock Test, which allows users to test their knowledge and see where they need to improve, and give them an idea of how they would do in the real Learner’s Test (it’s specifically designed to be similar to the K53 Learner’s Test). If you do badly on Road Signs in our Mock test, for example, then you know that you need to study Road Signs a little more. To take our Mock Test, go to GetYourLearners.co.za/register and register for free to begin testing yourself now! Take a look at our K53 Driving Revision for Cars, Trucks and Motorcycles. Learn about how the driving tests work and what you need to know for them. To get started, simply choose what you’d like to learn about from The Test Menu on the right. We explain how the K53 examiners will mark you during your Driver’s Licence Test – see what errors will cost you the most points and what areas you need to focus on most. Being a safe driver is the number 1 priority. The structure of the Motorcycle test differs from the Light and Heavy Motor Vehicles – make sure you know the differences! We explain what the Driver’s Licence Test consists of – make sure you are aware of the relevant time constraints for your vehicle type (LMV or HMV). Learn about the relevant manoeuvres and requirements you need to know for the Road Test for your South African Driver’s Licence. The point of the motorcycle pre-trip inspection is to show the examiner that your vehicle is roadworthy. We explain how to conduct a pre-trip inspection for your South African Motorcycle licence test.